A plane crash in Panama in 1994 that killed 21 people, many of them Jews, was the result of a terrorist incident, Panama's president has said. 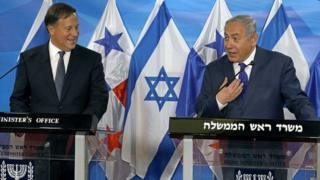 Juan Carlos Varela said the evidence came from Israeli intelligence and he had asked for the case to be reopened. Prominent Jewish businessmen were among those on board the plane that crashed shortly after take off on 19 July 1994. The crash happened the day after a bombing at a Jewish centre in the Argentine capital, killing 85 people. Argentine prosecutors blamed Iran for the planning and financing and accused the Lebanese Shia Islamist movement Hezbollah of carrying out the attack on the Israeli-Argentine Mutual Association (Amia) Jewish community in Buenos Aires. The Iranian government has always denied any involvement in the bombing which also left 300 people injured. Speaking to reporters in Panama on Monday, President Varela said he would ask local and international authorities to reopen the investigation into the plane crash, "given intelligence reports that clearly show it was a terrorist attack". He has just returned from Israel, where he met Prime Minister Benjamin Netanyahu. At a joint news conference there, he referred to a letter he received from Mr Netanyahu last November "confirming that I lost my roommate and a senior member of the Panamanian Jewish community to a terrorist attack conducted by Hezbollah in Panama some years ago". Nineteen passengers and three crew members were on board Alas Chiricanas Airlines Flight 901 to Panama City when it exploded shortly after take off from Enrique Jimenez airport in Colon. Twelve of the passengers were Jews. At the time, the country's President-elect Ernesto Perez Balladares said it appeared that a bomb had exploded inside the cabin, but this was never confirmed. The FBI has previously said that a man named Ali Hawa Jamal was believed to have carried the bomb on to the plane and died in the explosion. He was described as being around 25-28 years old, of Middle Eastern appearance, and had previously travelled to Lebanon, Venezuela and Colombia.